Catering can help set the tone for a wedding. But beyond that, it can help express your personal wedding style. 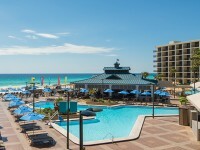 Over time, couples have come to request some of Hilton Sandestin Beach’s signature food and beverage items, but keep in mind that these are starting points – we look forward to meeting with you to customize our wedding catering menus for your Destin wedding reception. The most important element to note is that our wedding menus are versatile – they can reflect a casual feel, perhaps served on one of our decks with a view to the beach. Presented beneath the chandeliers of our Emerald Ballroom, the statement is elegance. We host buffets as well as sit-down affairs; rehearsals and receptions; breakfasts for bridesmaids or groomsmen; dressing room refreshments and farewell brunches. What do our signatures taste like? For your rehearsal dinner, imagine a salad of baby lettuces with goat cheese; Cajun-inspired boiled shrimp in the shell (served on ice with all the trimmings) and a chocolate torte. Or, keep things low-key with Angus burgers and grouper right off the grill – and key lime pie for dessert. 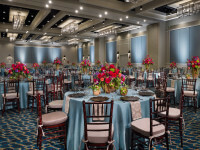 For your reception, think butler-passed hors d’oeuvres including seared sirloin with pesto mayo on crostini; entrees including a mixed grill of grouper, mahi mahi and jumbo shrimp; chef-carved meats including roast pork loin; and bananas foster, flambéed for your guests, to complement your wedding cake. Of course, your farewell brunch could feature made-to-order omelets and bone-in ham – carved on request and served with red-eye gravy – accompanied by mimosas and bloody marys. 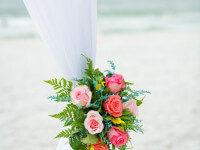 Sample menus for Hilton Sandestin Beach weddings. Contact us today for more details!